Wash and dry your fruit. Gooseberries should be scored through to the seed, sectioned, and evenly sliced. 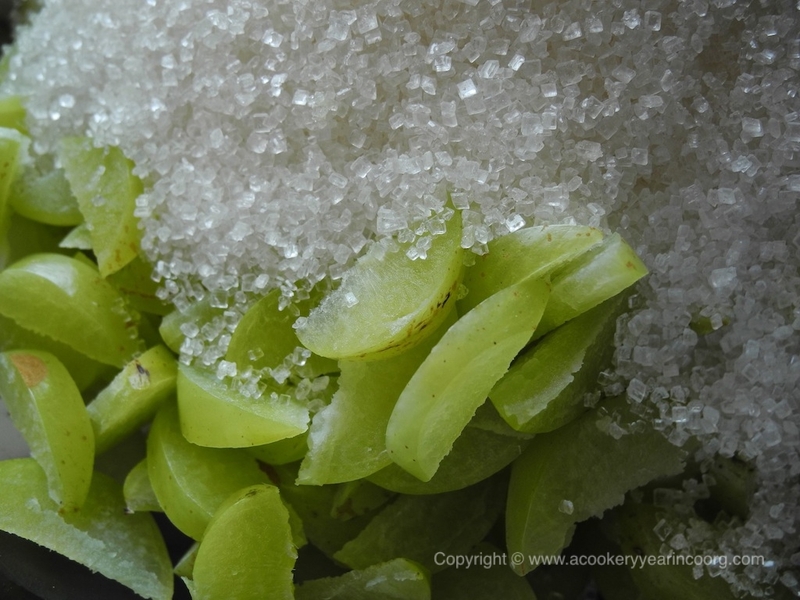 It’s not essential to slice the fruit, but it does help speed up the process of maceration, especially with the larger variety of gooseberry. Removing the seeds also makes the straining process easier.The gooseberries will typically release most of their juice in the first two days. For every kilo of prepared fruit use 500gms of cane sugar. For kaipuli or lime juice, use 2/3 cup of sugar for every cup of juice. Pour into wide mouthed, non reactive dishes, stir to mix, then place in the sunniest spot in the garden. Cover with a food net, or muslin if there’s likely to be much dust about. Don’t forget the water bath! Stir a couple of times a day, just to be sure the sugar is thoroughly dissolved. And remember to bring the dishes in at night! After three days in the sun (or when the liquid level has reduced by about an inch), strain and bottle it. Refrigerated, this syrup keeps well for up to two months.